Sid Laverents was the American 20th Century. Usually, this space concerns itself with cult films of the horror and/or sci-fi persuasion, but for The Sid Saga, we make a bit of an exception. I feel like Sid himself was an exception, yet his experience of 100 years on the piece of ground between Canada and Mexico in a very real (and surprisingly thorough) way sums up the "American" narrative. See, in 1985, a Southern California septuagenarian named Sid decided to turn his scrapbook into a documentary film. 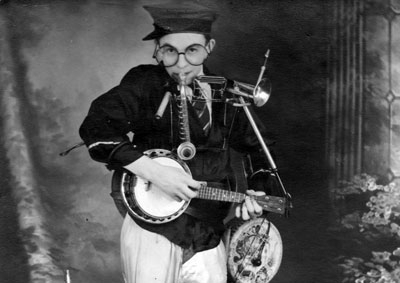 Within that scrapbook, he had chronicled his early years as the son of a poor, immigrant real estate speculator traveling around the Western United States, to his teenage years where he migrated to New York and became a vaudevillian and novelty performer as a one-man, 14-piece jazz band. Sid then got married and supported his small family as a sign painter and itinerant musician, before settling down in Florida. For a bit. Then his marriage went south, he transitioned into another one, and moved to California on the eve of World War II. Hearing that guys with defense jobs were less likely to get drafted and deployed, he landed just such a job in the aerospace sector, but got shipped out overseas anyway, spending the war in India. He came back to see another marriage dissolve, and transitioned into another one. Then, in his fifties and after two careers, he got laid off after 20 years building Cold War military gadgetry, and took up filmmaking. He sold a number of educational films he created, and he started racking up awards. That's where he stood between 1985-1989, when he created the first three parts of The Sid Saga by combining still photography, film, and animation. He returned to the project several years later, making a coda on video that chronicled the death of his third wife, his continued experiences as a filmmaker, and his courting of a new wife. These are cynical times. Nobody seems to remember what America was supposed to be in the first place -- the only thing anyone can seem to agree on politically is that we're all headed in the wrong direction, but they can't agree on the whys and wherefores. I submit that Sid was what America was supposed to be. The child of immigrants, starting with nothing, Sid created and recreated himself over the course of a long life, thanks to his own hard work, ingenuity, and spirit. His story touches on the urbanization of America, World War II, the Cold War, the rise of suburbia, and how those manicured vistas and carefully cultivated fronts often contained families dissolving from within. Sid's is a fascinating story, well told, and worth seeking out if you have the chance.